BRUSSELS (AP) — A keen-eyed witness who spotted a pale, slender figure fleeing an apartment near a Brussels auto plant one week ago set in motion a vast police dragnet that within 72 hours led to the capture of Salah Abdeslam, the most-wanted man in Europe. Another key — if unwitting — helper in leading authorities to the hideout of their high-value quarry was a pallbearer at the burial of the fugitive's brother. Abdeslam is being held in a Belgian high-security prison, with France seeking his extradition so he can stand trial for his alleged role in the Nov. 13 rampage of gunfire and suicide bombings that killed 130 people. The 26-year-old Frenchman was arrested Friday after being run to ground by investigators in the same gritty Molenbeek neighborhood of Brussels where he grew up. Much remains unclear about Abdeslam's movements in the four months he managed to elude authorities multiple times. "We're still far from completing the puzzle," Belgian federal prosecutor Frederic Van Leeuw acknowledged Monday. 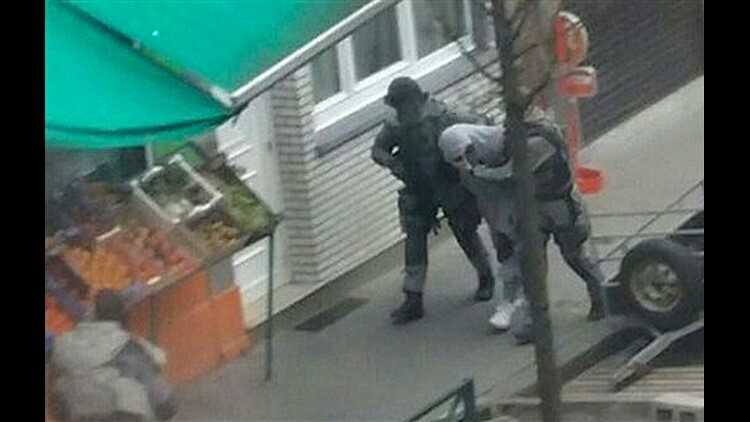 The fugitive's luck began to run out on the afternoon of March 15, when a six-member police team showed up to search an apartment believed linked to the Paris attackers, according to government and security officials. The joint Belgian-French search party thought the residence near an Audi factory in south Brussels was vacant because the water and power had been turned off for weeks. But as soon as they opened the door, they were fired on from inside by at least two people wielding a Kalashnikov assault rifle and a riot gun, officials said. In the melee, four police officers were slightly wounded, and two occupants of the apartment managed to slip away, reportedly via the rooftop. One witness got a good enough look at one of the escapees to describe him to a police sketch artist, said Ahmed El Khannouss, the first deputy mayor of Molenbeek. The portrait that resulted "bore a very strong resemblance to Salah Abdeslam," El Khannouss said. Forensic scientists found Abdeslam's fingerprints in the apartment. There also was the body of a suspected Abdeslam accomplice who was shot and killed by a police sniper as the gunman prepared to fire on police from a window, along with a Kalashnikov, a stockpile of ammunition, and a banner of the Islamic State extremist group. That's what Belgian authorities made public. What they didn't disclose, said former French intelligence agent Claude Moniquet, was that they also recovered cellphones that quickly told them who the apartment's occupants had contacted. Now that his cover had been blown, "the working assumption of the police was that Abdeslam would go to a place he knew," said Moniquet, director of the Brussels-based European Strategic Intelligence and Security Center. Most likely, that meant Molenbeek, home to one of the largest North African communities in Belgium and the area where Abdeslam grew up with several of the Paris attackers. Abdeslam's older brother Brahim, one of the Paris suicide bombers, was buried Thursday in a Brussels cemetery after French investigators finally released his remains to the family. A score of mourners came to the funeral, as did police. "There was a check of identify papers," El Khannouss said. Moniquet added that police "interrogated people, took information on their phones." Photos published in the Belgian press showed that one of mourners who carried Brahim Abdeslam's casket was a young man with a beard who wore a black knit cap. Identified as Abid Aberkan, he is related to the Abdeslam family, El Khannouss said, although he added he wasn't sure of the precise blood connection. The Molenbeek official believes some mourners were tailed by authorities as they left the cemetery. In any event, according to Moniquet, "from that time on, they immediately focused on Aberkan. By Thursday night, they were absolutely sure that he (Abdeslam) was hiding in the apartment of Aberkan's mother in Molenbeek." That apartment is at No. 79 Rue des Quatre-Vents — the Street of the Four Winds — a rundown three-story dwelling that belongs to the municipality and serves as low-income housing. The ground-floor windows are boarded up and the basement windows are barred with ironwork. At around 4:30 p.m. Friday, the usually quiet neighborhood was swarming with heavily armed police, said a 32-year-old woman who lives across the street. She identified herself only as Aman, refusing to give her last name because she said she was afraid and hasn't been able to sleep since then. She said she watched through the curtains of her front window at about 4:40 or 4:45 p.m. as Abdeslam bolted from the front door of No. 79, turned left, and was shot in the leg by a SWAT team that had sealed off the street. "Police said to stop. When he didn't, they shot him," Aman said. The officers may not have realized who they had captured at first. According to El Khannouss, Abdeslam was so wan and had lost so much weight while on the run that police didn't immediately recognize him. Two other locations connected to members of the Aberkan family were simultaneously surrounded, including Aberkan's home in Jette, said Thierry Werts, spokesman for the Belgian Federal Prosecutor's Office. Aberkan and a suspected accomplice of Abdeslam's who had been hiding in the same Molenbeek apartment also were arrested and have been ordered held.